Hong Kong (VNA) – The Consulate General of Vietnam in Guangzhou city, the Chinese province of Guangdong, has held a banquet in celebration of the 67th founding anniversary of the countries’ diplomatic ties (January 18, 1950). The event on January 18 drew many Guangdong officials and entrepreneurs, along with Vietnamese people living in the Chinese province. 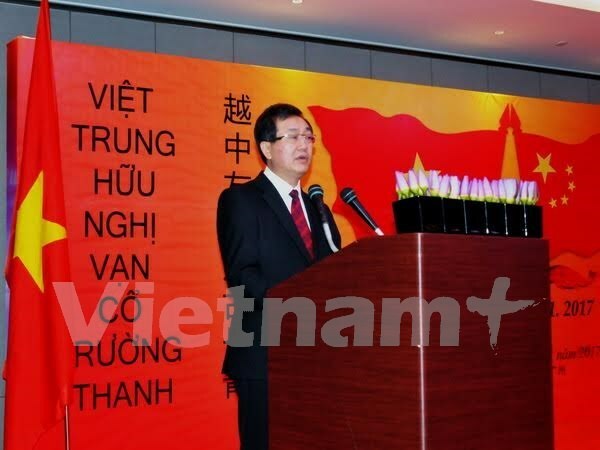 In his address, Consul General Nguyen Tien Hong said during the past 67 years, the Vietnam-China traditional friendship, nurtured by generations of their leaders, have continually reinforced. The Vietnamese people always keep in mind the enormous support and assistance given by the Chinese Party, Government and people throughout history. The unceasing consolidation and development of the friendship and cooperation is completely in line with the fundamental and long-term interests of the two peoples, thus contributing to peace, stability, cooperation and development in the region and the world, he added. He noted the Vietnam-China comprehensive strategic cooperative partnership has been thriving in recent years as seen through regular mutual visits by their senior leaders. In 2015, Vietnam became the biggest ASEAN trading partner of China, which in turn posted a record increase of its tourists in 2016, reaching some 2.7 million, to the Southeast Asian nation. Many cooperation agreements between Vietnamese localities and Guangdong have been implemented, strengthening their economic, trade, investment, tourism, cultural and sci-tech partnerships. At the end of November 2016, trade between Vietnam and Guangdong rose 2 percent year on year to about 15.2 billion USD, Hong said, voicing his belief that their multi-faceted ties will keep expanding in the future. Echoing Hong’s view, Guangdong Deputy Governor He Zhongyou said the traditional friendship between the two countries has been fortified with growing exchanges and cooperation in all fields between their Parties and States. Guangdong and Vietnam have also enjoyed significant cooperation achievements in terms of high-ranking visits, trade, investment, agriculture, tourism and culture thanks to strong promotion by the countries’ Party and State leaders and the Consul General’s active coordination.